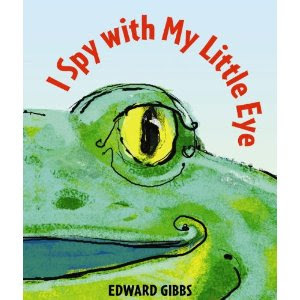 I selected I Spy With My Little Eye , by Edward Gibbs to enjoy with Bookworm1. This book is so cool. Really cool. Amazingly cool. (I am a particular fan of it, and Bookworm1 thought it was pretty awesome as well!) The book contains spy holes for you to guess at what you might be spying. Turn the page and discover if you are right! Furthermore, both the front and the back cover has a cut-out and if you open the book out completely, you can spy a frog on the spread. Artistically speaking, I think this book rocks! Gibbs was quite creative in playing his game of eye spy, inviting the reader to play their own game at the conclusion of the book - using a spy hole, of course! Love it, love it! Lastly, I figured both boys would enjoy Cars Galore and my guess was right on there as well! This book has been read many, many times over. 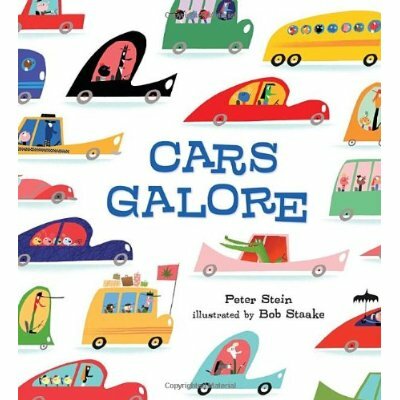 Told in rhyme, each page displays and describes a variety of rather interesting cars. Some are tall (and look like buildings), some are music related and others are driven by animals. My boys both like reading the words and spotting the cars in question. This book is not just a fun read, but it is also a fun game. If you have little ones who like checking out various means of transportation and machinery, then we highly recommend this read! Thank you, Candlewick Press, for sending these books our way! We have loved them! The three titles you chose would all be hits with us! As you know, we love Maisy and Lucy Cousins (except her book of nursery rhymes...they're a bit dark). We'll be looking for these titles! 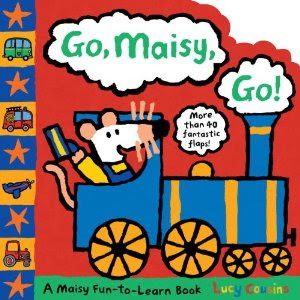 we just sadly put our copy of Go, Maisy, Go into a garage sale pile. It was well-used and well-loved though. I'm a bit nostalgic for my girls' Maisy days.